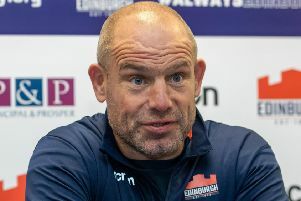 Teenage winger Jack Blain is ready to face the rigours of the Guinness PRO14 and can make his mark in the pro ranks, according to Edinburgh Rugby head coach Richard Cockerill. Blain, 19, has been handed a competitive debut by Cockerill ahead of this afternoon’s crucial encounter in Treviso against Benetton (kick-off 3pm GMT/ 4pm local). Win and Edinburgh’s play-off dreams in Conference B are very much alive, but lose and it looks like it would take a lot for them to make the top three by the end of the regular season. With the likes of Darcy Graham (rested by Scotland) and injured duo Dougie Fife (head knock) and Duhan van der Merwe (laceration on his knee) not making the trip to Italy, Stewart’s Melville College product Blain has been given the number 11 jersey. 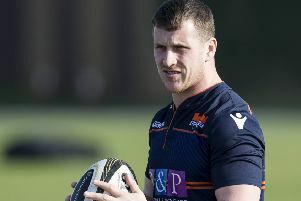 Blain did play in the pre-season friendly match against Bath at Meggetland – becoming the first player born this century to pull on an Edinburgh shirt in the process – and since then has been turning out for Heriot’s in the Tennent’s Premiership and Scotland under-20 in the age-grade Six Nations. Last Friday he scored a brace of tries in the under-20s defeat to France and on his selection Cockerill said: “He played in pre-season against Bath, he has been training with us the whole season and he scored a couple of tries last week for the under-20s and he is the next winger within our group. “There are a few guys being rested for Test duty from the back three and Dougie Fife hasn’t recovered from last week’s injury so it is an opportunity to give a young man an opportunity when he has been training well. At the other end of the experience scale Edinburgh are able to call upon Scotland caps Hamish Watson and WP Nel in the pack. Watson, the 27-year-old back-row, has been out of action since January 18 with a fractured hand suffered against Montpellier in the Heineken Champions Cup pool match while tighthead prop Nel, 32, has not played since he picked up a calf injury on international duty against Italy on February 2. “Hamish has been training pretty much fully from a conditioning point of view since he go injured because it was a hand issue so now he is comfortable and ready to play,” the head coach said. No.8 Viliame Mata, fresh from penning a new deal, misses out with a tight hamstring so Scotland Sevens man Ally Miller is in that position. Chris Dean returns in the 12 jersey having been in France with Scotland last week as cover and Henry Pyrgos, in a similar boat, is available and captains the team from scrum-half. “Benetton are as good as anybody else in the competition.,” Cockerill warned. “They’re one of the form teams and if we lose we’re going to drop seven, potentially eight points behind them.